In A Florida State of Mind: An Unnatural History of Our Weirdest State, James D. Wright makes the case that there are plenty of reasons to be scandalized by the land and its sometimes-kooky, sometimes-terrifying denizens, but there's also plenty of room for hilarity. A witty history of the state that's always in the news, for everything from alligator attacks to zany crimes. There's an old clip of Bugs Bunny sawing the entire state of Florida off the continent—and every single time a news story springs up about some shenanigans in Florida, someone on the internet posts it in response. Why are we so ready to wave goodbye to the Sunshine State? 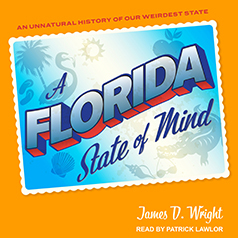 In A Florida State of Mind: An Unnatural History of Our Weirdest State, James D. Wright makes the case that there are plenty of reasons to be scandalized by the land and its sometimes-kooky, sometimes-terrifying denizens, but there's also plenty of room for hilarity. Florida didn't just become weird; it's built that way. Uncharted swampland doesn't easily give way to sprawling suburbia. It took violent colonization, land scams to trick non-Floridians into buying undeveloped property, and the development of railroads to benefit one man's hotel empire. Yet everyone loves Florida: tourists come in droves, and people relocate to Florida constantly (only 36% of residents were born there). Crammed with unforgettable stories and facts, Florida will show listeners exactly why.